Today's post is my first ever partnered post! I've previously received a tiny handful of other partnership opportunity offers (free product in exchange for a post), but this is the first one that I've accepted. I haven't had the need to develop a formal policy regarding potential partnerships or sponsorships, but I do have a few ground rules for myself. First and foremost, I will not accept opportunities from brands and retailers I would not personally purchase from on my own. Second, any post that arises from a partnership or sponsorship will be clearly disclosed as such in the body of the post. Third, if I received a product in relation to working with a company, I will disclose that again in every subsequent post in which the product is mentioned. Fourth, I would need to be in control of the written content associated with any such post, such that I could express my honest opinion about the product or brand at issue. A quick note on terminology: "partnered posts" in my case means that I received the product for free (or, potentially, at a discount), with the request that I post about the item on my blog. I've adopted "c/o" as an abbreviation for "care of," which means that I received an item for free. "Sponsored posts," if it ever comes up (and I don't think it will, given my teeny-tiny Internet footprint), refers to a situation where monetary compensation was involved. Now on to the product review: Grana (referral link, new customers receive 10% off their first order and I receive $20 store credit) reached out to me recently because of my previous posts about their items, offering me the opportunity to receive a few products for review consideration. As they're a brand I already enjoy shopping from on my own, I was happy to accept. At least one more post highlighting some of their more recently released silk tops is forthcoming soon. 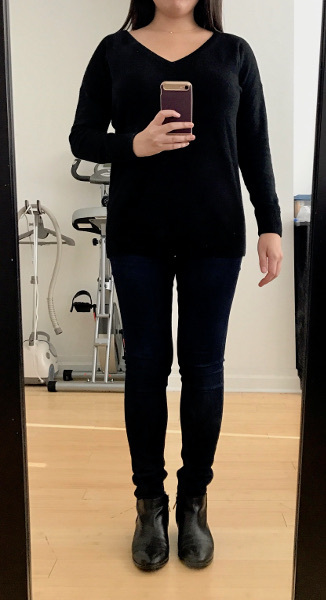 I chose the Cashmere Boyfriend V-Neck sweater because I'm fond of slouchy sweaters with an intentionally slightly oversized fit. In my photos you can see it both pulled down, where the hem rests a little past my hips, and hitched up a bit, like on the model. The design is on the roomy side for a slouchy sweater. I would still say that it fits true to most mall-store sizing when one aims for the intended slightly oversized look, and my usual size S was correct. For fit reference, I'm roughly 36''-26''-37'' and 5'3'' with a more "regular" sizing torso and shoulder width and shorter "petite" pant-length legs. In general, I've found Grana's product measurements, which are offered for every item and size, to be accurate and helpful. Grana's silk products run a touch smaller than, say, Loft or Madewell sizing. I still take my usual size S for the most part, but get a less drapey look. This sweater seems to run true to size, in that light. The one unexpected fit-related quibble I notice is that the cuffs are knit a tiny bit thicker and more snug than I'd expect, so its a little more difficult and less comfortable to push the sleeves up to my elbows than I'm used to with various other sweaters. They may stretch with time as I keep pushing the sleeves up. Otherwise though, I'm very happy with this design, it's exactly what I had in mind for a slouchy v-neck sweater, one that I'd be happy to wear to work with slim-fitting dress pants as part of a more "casual business-casual" look. Cashmere quality-wise, I'm also very satisfied. The cashmere feels noticeably thicker and a cut above that of comparable sweaters I bought last year at Uniqlo and H&M Premium Quality (the Uniqlo held up fine in the last year and the H&M proved rather prone to pilling). It's more difficult to compare it to my deeply discounted, originally pricey White & Warren sweaters, as both were intentionally designed to be fine, thin knits, with little pointelle or lacy details. Texture-wise, I honestly find all the cashmere I own, including this Grana sweater, to be in a similar range of softness, with the caveat that darker colors feel a little less soft. The only difference I notice with the Grana compared to any of the others is that this sweater feels and looks a bit fuzzier (hard to explain, it's minor, but noticeable when putting them side by side for the first time), and I'm not sure if it's because the sweater is a little thicker than the others I have. 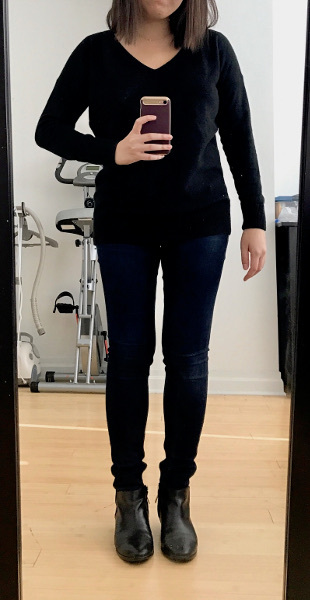 If you need more information regarding Grana's cashmere: Elaine at Temporary Housewifey has done a few Grana cashmere reviews, and she is able to compare them (as equally favorable) to their direct competitor, Everlane. She's generally done more research on how to assess cashmere quality, and rates both Grana and Everlane as superior to J.Crew.